So I know I've been a little MIA lately. I have had a lot on my plate. But I haven't stopped my jumping jacks!!! I hope you haven't too. We have about 5 more days in June, and I'm at 5000. That means 1000 more to go, but I know I can do it over the next couple of days. You were not expecting that jumping jacks would be your only workout this month, right? I have spent a lot of time in airports recently, and given the physical person that I am, I realized I cannot go without working out just because of a lame excuse like 'travel'. So I reverted to surviving on jumping jacks and yoga for a few days. This involved some very iffy action next to bathrooms in planes and in airports, which I will not discuss. DoYogaWithMe helped me out a lot. But frankly, because that requires internet access, I focused a lot on building up my own yoga programs. I mean, people are already looking at me all crazy exercising in airports. I'm not sure the video thing would be taken as normal in a lot of places. Anyway, here are a few yoga tips I gathered along the way that I thought I'd share. They may seem intuitive, but hey, probably not to everyone. The right mat goes a long way. If you are new to yoga, especially yoga on the road, you don't know what types of surfaces you will encounter. Buy a light-weight, sticky, non-slip mat to protect yourself. Don't forget to breathe. This is not a joke. There is a reason yogis stress the importance of the in-out. You need oxygen to flow through your body, and you need something to consistently focus on. Breathing right can be the difference between doing more today than yesterday. Your name is Tola, so be Tola. One big mistake we all make is the "I want to be like him/her" syndrome in yoga. You move at an entirely different pace that any other person, your innate flexibility is different, and your progression is different. It doesn't matter if everyone in an airport is staring at you; focus on your breath, close your eyes if necessary, and go at your own pace. If you feel pain, stop. There is a difference between discomfort and pain. Discomfort is when your body is not used to a pose. You get over this in time. Pain is when you know something is just not right. Again, not every pose is for everyone. If you believe something is not right for your body, STOP! It took me a while to get used to doing this, but it is important. Find your own brand of yoga. There are so many different types of yoga, from Power yoga to Bikram yoga to Hatha yoga. Not everyone works well with every type of yoga. Some folks have more brain power and can last in one uncomfortable pose for a very long time. Others might be able to push further into the poses, but only last for shorter periods. Others might love to sweat profusely, while some may not. The key to consistent exercise is understanding what works for you. 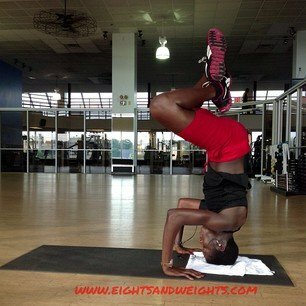 FYI - Follow me on Instagram (@eightsnweights) for daily poses, nutrition challenges, tips, and motivation.